Vance Astro, aka "Major Victory," has a quite interesting history. In the far-flung, amazing sci-fi future of 1988 (the character first appeared in 1969), he volunteered for Project: Starjump, mankind's first interstellar expedition. His blood was replaced with preservative fluid, and his entire body was permanently encased in a flexible copper-alloy containment suit - all this in an effort to stop him from aging, since the journey to Alpha Centauri would take 1,000 years. When he arrived, he found not an abandonned planet, waiting to be explored, but a fully functioning human colony, welcoming him as a hero; while he travelled, humanity had developed faster-than-light drives, passing his slower ship en route. In his first appearance, Vance's containment suit was a dark purple, but that soon changed to blue and white - or, technically, "a black and silver alloy," but it was sure never colored that way in the comics. The blue covers his head, shoulders, and chest, then jumps down to the stomach, waist and mid-thighs, before picking back up again for the boots and gloves. The colored sections are vaguely diamond-shaped, and on most of the figures I've looked at, are applied fairly well. The blue is metallic, while the white is completely free from any airbrushed shadows, but is thick enough to ensure complete coverage with no bleed-through. You'll still want to look the toy over before you buy it, just in case there's any spillage, but for the most part this is nice. Even the Guardians of the Galaxy's team symbol - a star with red, white and blue sections - is painted on cleanly. 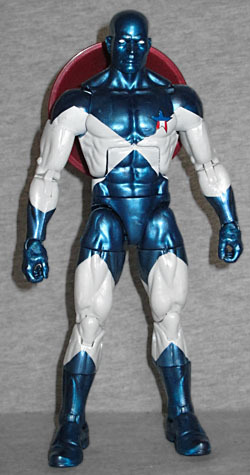 Astro (which is a shortened form of his real last name, Astrovik [itself shortened by his Slovakian grandfather from the original "Astroyevicht"]) uses the medium Marvel body, which is a logical enough choice. His head is new, but we may see it again - since his "costume" is actually replacement skin, every detail of his face is perfectly visible. The articulation is unaltered from other uses of this mold, because he doesn't really quire any special new parts to set him out from the crowd. 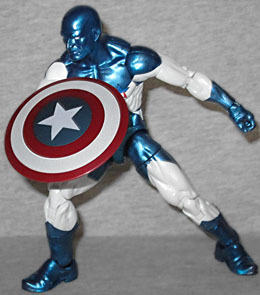 He does, however, come with an accessory: Captain America's shield. See, Vance was a fan of the superheroes he'd known in his youth, so in the future he made it a point to track down one of history's great lost artifacts, using it as a symbol to reunite humanity. He wasn't as skilled with the shield as Cap was, so rather than trying to get it to riccochet to him on its own, he used his telekinesis to direct it. The figure also comes with the left leg of this series' Build-A-Figure, Titus, which might do a little to help his sales. But just a little, because really, it's only a leg. 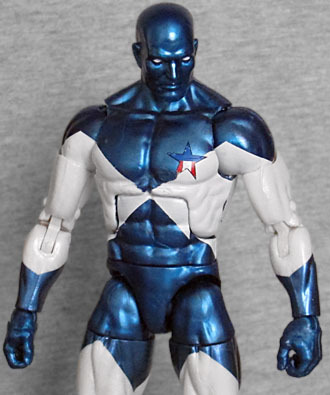 Vance Astro was one of the founders of the Guardians of the Galaxy (the original team), but when they had the opportunity to travel back to the present, he met his younger self, activated his mutant powers, and convinced him not to join the Air Force, thereby changing his own future. 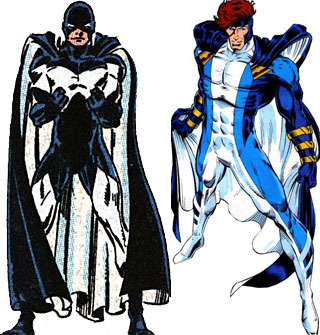 Adult Vance went back to his own future (because that's how time travel works in the Marvel Universe), while younger Vance stayed on Earth, joined the New Warriors and eventually the Avengers as Justice - making the two Vances the only person to be included on the Avengers' member rolls twice. This probably isn't a very interesting character, unless you're already familiar with the original Guardians of the Galaxy; and unless Hasbro gets it in their mind to create more of the year 3000 team, he won't have anybody to hang around with.